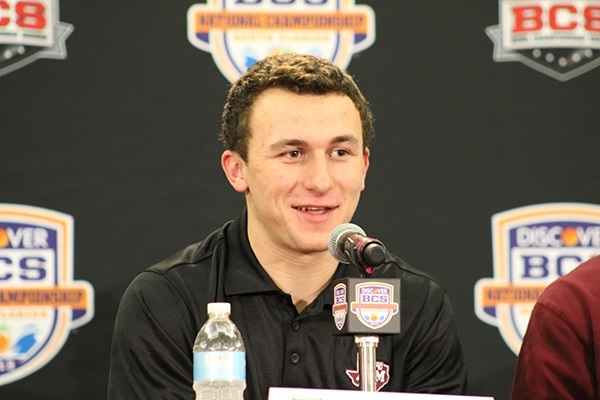 Manziel epitomizes the strengths and weaknesses of a creative manager. See below. Photo by Matt Velazquez. In last week’s Futures on Georgia quarterback Aaron Murray, I described quarterbacking styles within the context of task-oriented management and creative management. Be it a white-collar, blue-collar, or athletic career, these are two basic ends of the spectrum when talking about management styles. Task-oriented managers love the routine and rhythm of a predictable, reliable process. As they acquire more experience, a high-functioning, task-oriented manager knows the boundaries of his processes so well that he’ll often appear far more spontaneous to a wide range of problems than he is. Matt Ryan and Tom Brady are perfect examples of high-functioning, task-oriented quarterbacks. They know every detail of what’s supposed to be happening in their environment and control it so well that they can anticipate most things that defenses will attempt to wreck an offense’s performance. When their teammates are playing efficiently, they appear far more creative than they are because their level of preparation helps them develop processes to avoid the same major issues that confound less experienced passers. I mentioned Peyton Manning and Drew Brees as task-oriented quarterbacks last week, but I’m having second thoughts. It’s not an exaggeration that Manning is a coach on the field. I’ve talked to a former Colts player who has played with three other teams and he affirms that Manning is unique in this regard. His intelligence and preparation might exceed every other quarterback who has ever played the game. This gives Manning a much wider box of operation than any quarterback in the game, regardless of style. His creativity comes in the strategic aspects of the game, but it’s rooted in having a fantastic memory and method of preparation. Last year ESPN ran a story about Manning contacting a former staffer with Tennessee to help him find tape of a play that he remembered was successful. Manning implemented it successfully as a red-zone call during the season. If I had to make a final call, I’d stick with the task-oriented label for Manning. I’m not as certain about Brees. I wonder if Brees is that rare individual who balances both worlds of task-oriented preparation and creative and intuitive problem solving when it’s time to perform. While the Saints quarterback is obsessive to the point that the smallest details of his workout routines don’t change –- to the point that teammates have to cut short what they’re doing to accommodate their quarterback — I’ve also seen Brees create when form and function go out the window and he does it as well as many of the quarterbacks on the far end of the creative spectrum. I believe Russell Wilson is also one of those players. His task-oriented skills are strong. When he arrived in Madison, Wisconsin he learned the Badgers system -– a more task-oriented, rhythm based, West Coast offense –- in record time. His preparation was so strong that he not only earned the starting job without contest, he was also voted team captain. But it was his play in North Carolina State’s offense for three years that impressed me the more than he did at Wisconsin. Wilson had to merge his understanding and execution of the offensive system’s process with his athleticism and creativity. He made off-balanced throws with anticipation and accuracy against blitzes that generally fluster most task-oriented passers. He could buy time, keep his head about him, and create productive results when the plays broke down beyond all sense of recognition. where is the text about johnny?